Is you skin feeling a bit dry and dull? 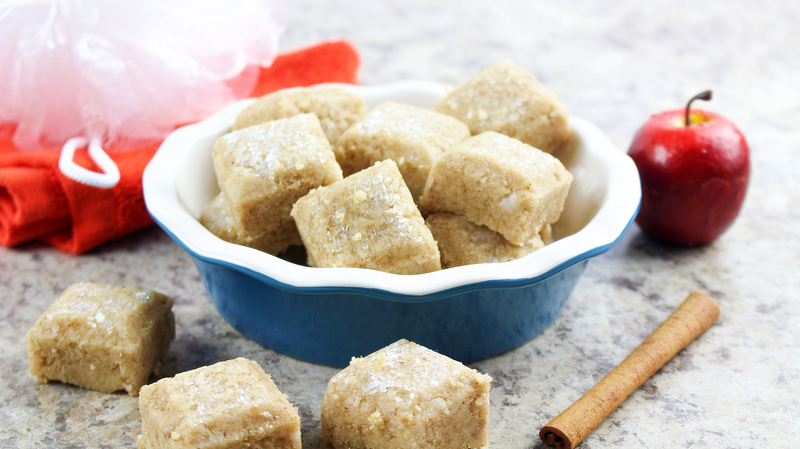 Then these Exfoliating Apple Pie Sugar Scrub Cubes are exactly what you need! 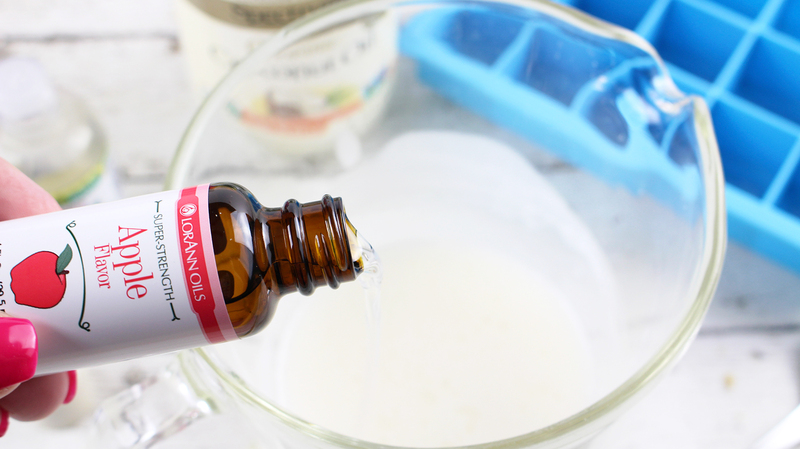 I love making my own DIY skin care products at home, especially ones for the bath and shower. There is nothing more relaxing than slipping into a nice warm bath, and indulging in some TLC. Okay, so I may have to bribe my kids to leave me alone for 20 minutes with candy, but at least I get some me time! 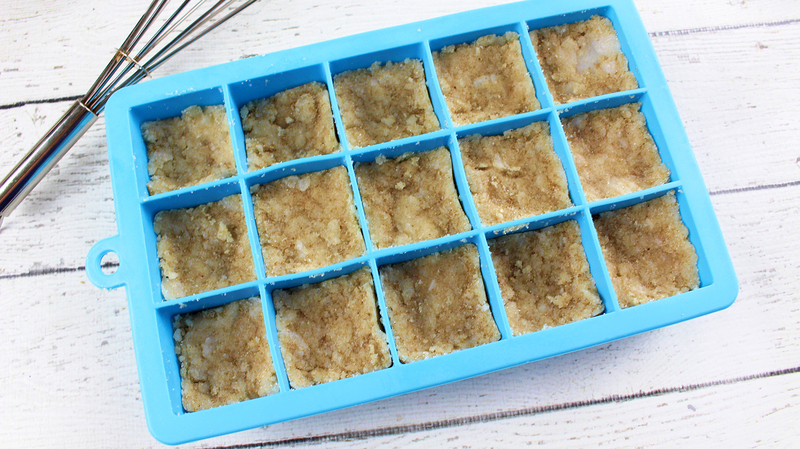 Not only are these exfoliating apple pie sugar scrub cubes extremely easy to make, they also are a great homemade gift idea for the holidays! Whip up a couple batches of these, or switch up the scent for the holidays, and the women you gift them to will be forever grateful. Gather all the ingredients you will need. Sprinkle some granulated sugar on the bottom of the silicone cube mold, then set aside. 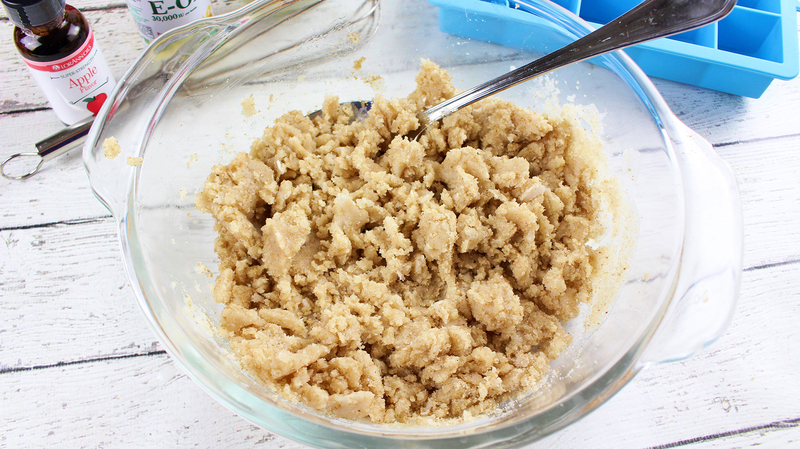 Next, add the brown sugar, cinnamon and nutmeg to a medium mixing bowl. Whisk until it is combined and then set aside. 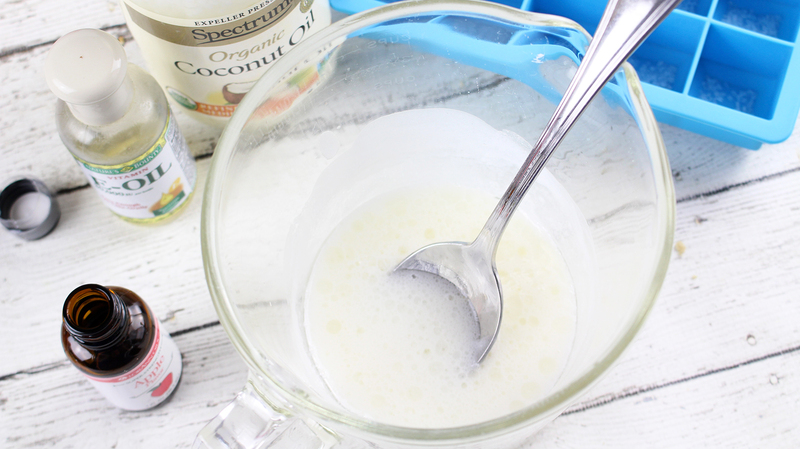 In a small mixing bowl, add the shea butter soap and coconut oil. Microwave on high for 20 seconds, or until completely melted, then stir. Allow to cool for 1 minute, then add a few drops of the apple oil. Next, add in a few drops of your Vitamin E-Oil. Stir well to distribute the oils. Pour your liquid into the brown sugar mixture. Immediately transfer the mixture into the cubed silicone mold. Press down firmly to ensure a packed cube. 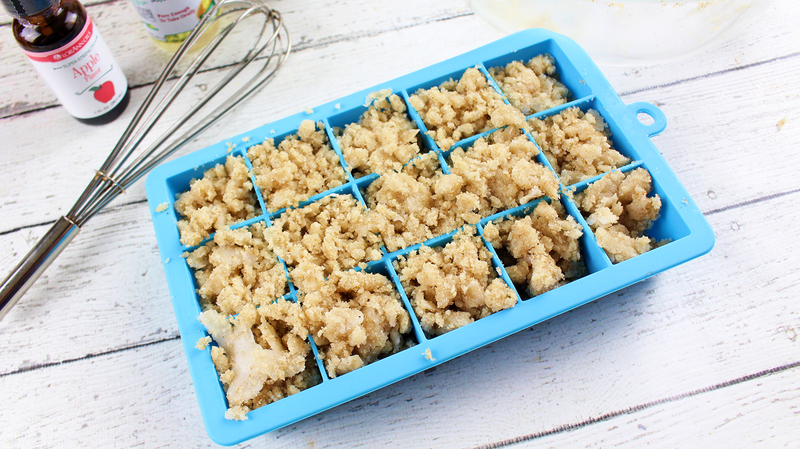 Place your tray into the freezer for 1 hour to allow the exfoliating apple pie sugar cubes to harden. Release the sugar cubes from their molds and then store them in an airtight container. Sprinkle the granulated sugar on the bottom of the silicone cube mold and then set aside. 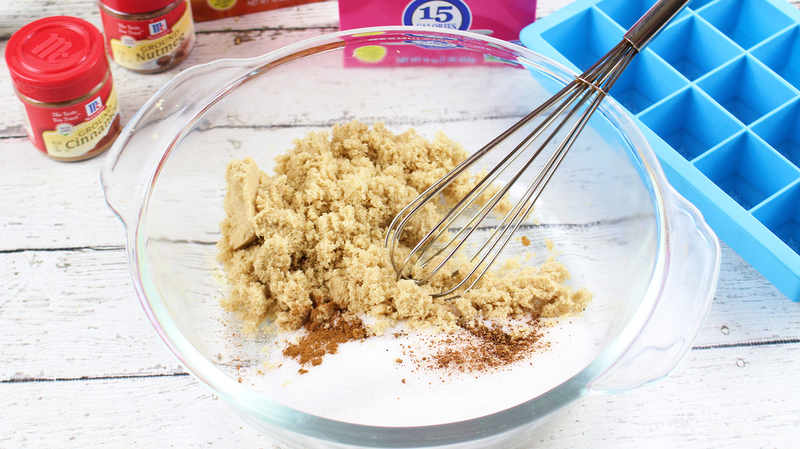 Add the brown sugar, cinnamon and nutmeg to a medium mixing bowl. Whisk to combine, then set aside. Microwave on high for 20 seconds or until completely melted. Remove from microwave, then stir well until combined. 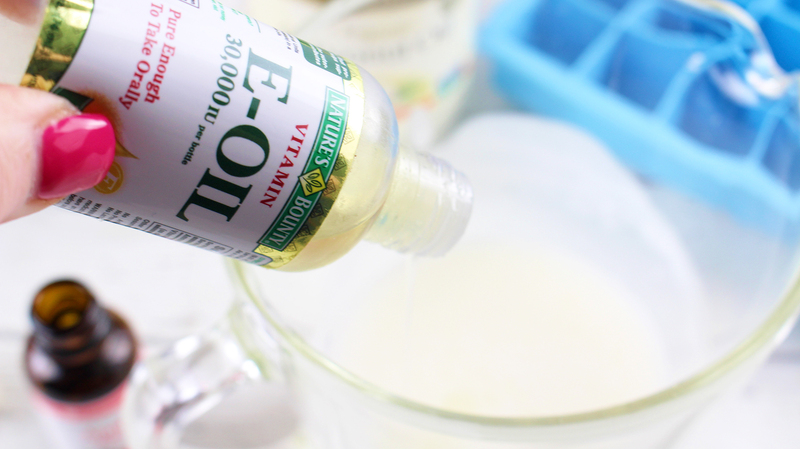 Allow to cool for 1 minute, then add a few drops of the apple flavouring and vitamin e oils. Stir well to distribute the oil. 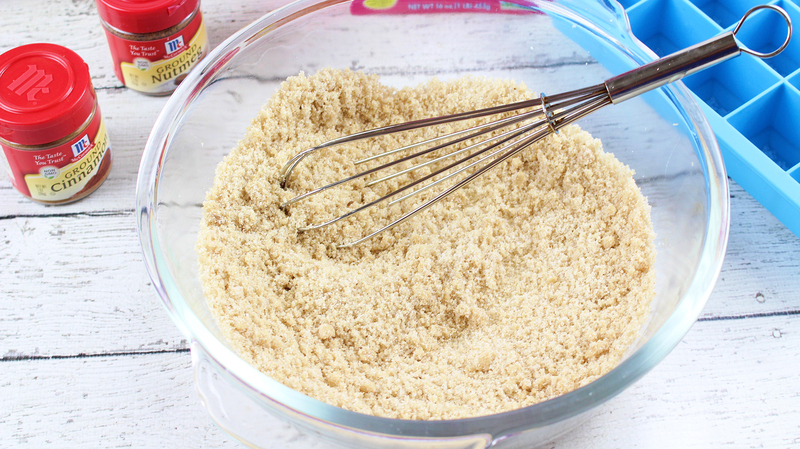 Pour into the brown sugar mixture, then stir well. Immediately transfer to the cubed silicone mold, then press down firmly. 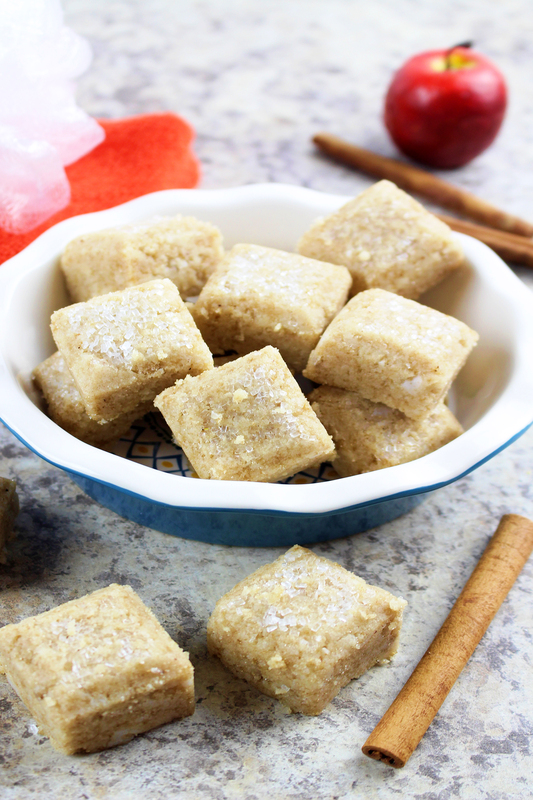 Freeze for 1 hour to allow the exfoliating apple pie sugar cubes to completely harden. Release the sugar cubes from their molds and then store in an airtight container. 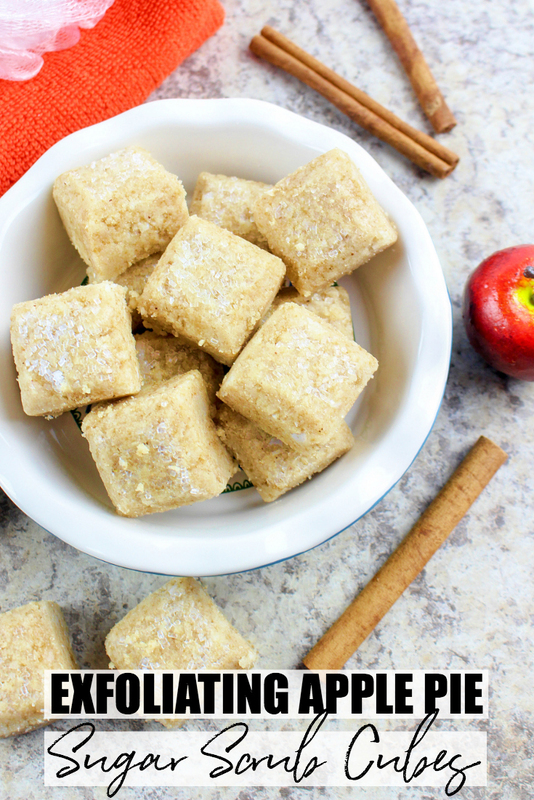 Bring 1-2 exfoliating apple pie sugar cubes into your shower or bath. Rub the sugar cubes on wet skin. 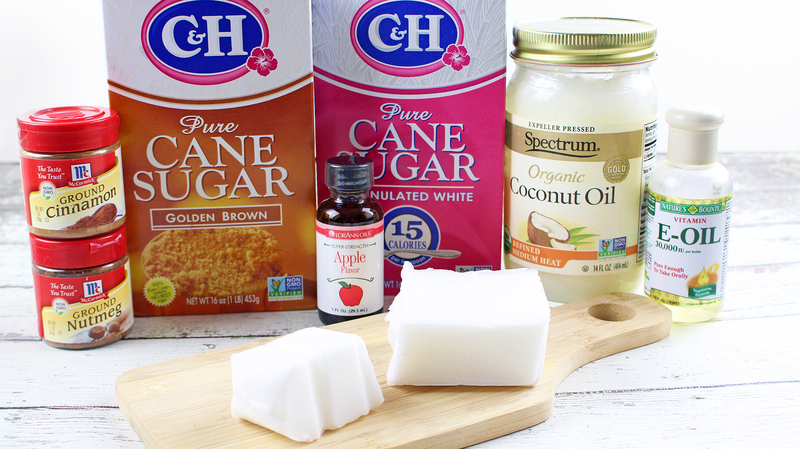 The sugar will help exfoliate and the coconut oil will moisturize your skin. Rinse well, then pat dry with a towel. 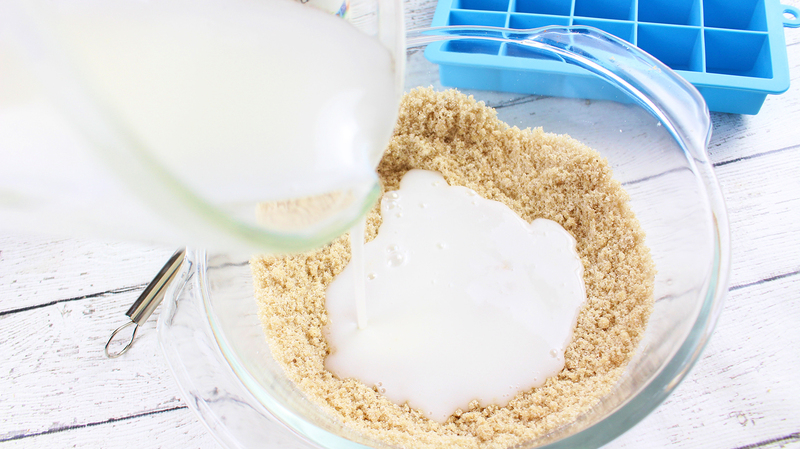 Check out my DIY beauty section for more great homemade skin care products! 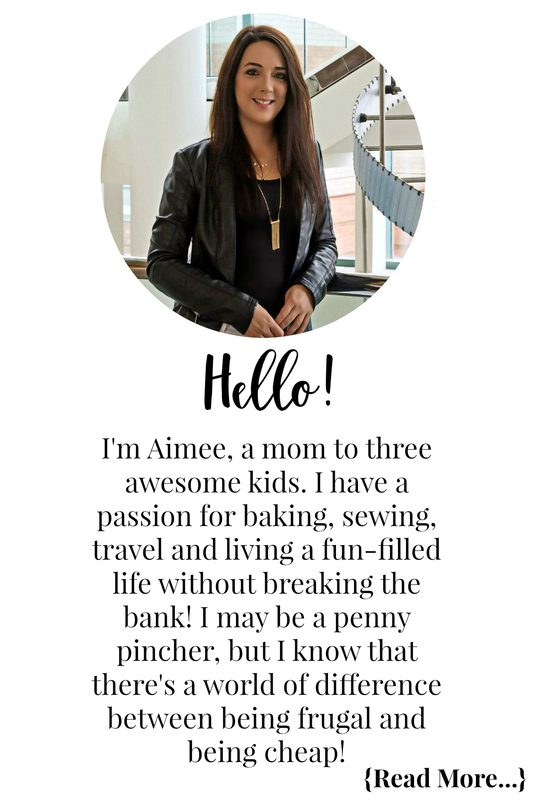 « Is Your Teen Ready for a Debit Card? That sounds great – and easy enough even for me to try!